STEP 2 - Are You Healthy or Injured? STEP 3 - Choose Your Package! Futsal is played between two teams of five players each, one of whom is the goalkeeper. Unlimited substitutions are permitted. Unlike some other forms of indoor football, the game is played on a hard court surface delimited by lines; walls or boards are not used. Technical Sessions w/ Study Hall : Wednesday ĒVLV and GEDI will be partnering for study hall & technical session. GEDI Study Hall: Study hall will run between 4pm & 6pm at the EVLV office facilitated by GEDI. Cheryl Golden has over 30 years on teaching experience and she is national board certified. She will be assisting the athletes with any homework or needs. ĒVLV Session: From 6pm - 7pm EVLV will run a technical session on the black top to enhance time retain and technical ability on the ball. Private Session: A private session is 60 minutes of dedicated time for one athlete and one EVLV coach. The session is to help the athlete in any specific areas that they need. Once you have purchased your package, please email us for scheduling at info@evlvempire.com. Semi Private Session: A semi - private session is 60 minutes of dedicated time for two athletes and one EVLV coach. The session is to help the athletes in any specific areas that they need. Once you have purchased your package, please email us for scheduling at info@evlvempire.com. ĒVLV offers three to five day camps to enhance players of all levels! 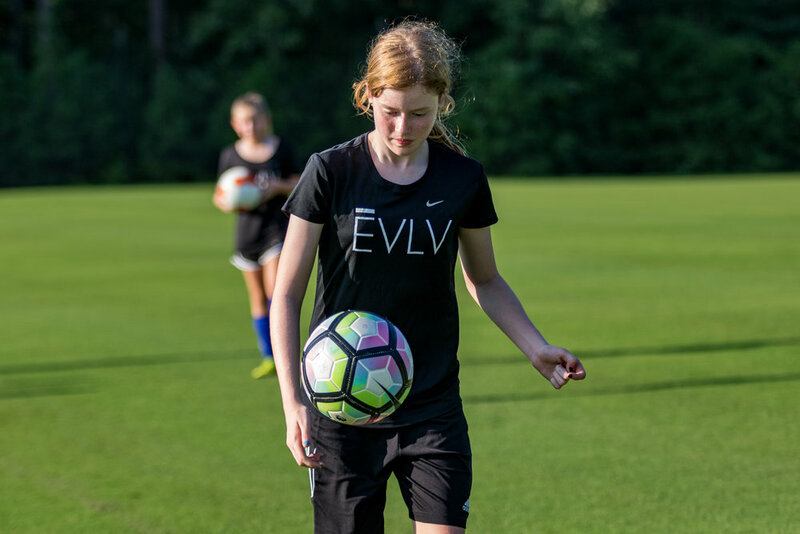 ĒVLV offers Kaizen Kamp which is an intense program that gives a glimpse into the demands of collegiate, professional and international soccer. Kaizen is for the female athlete that wants to be pushed out of her comfort zone by technical proficiency, tactical IQ, physical endurance and mental toughness. KAIZEN KAMP - Winter 2017 ĒVLV offered a three day Kaizen Camp that helped our high level players prepare for their spring seasons. ĒVLV clinics are a half to full day training sessions that showcase positive outside influences within the female game. We partner with strong organizations and inspiring female to give our ĒVLV athletes the best experience. In February 2018 EVLV partnered up with Bon Secours, Girls Can and ONYX. Ashleigh Shim, former player for the international Jamaican women's soccer team, joined us in 2017 for a special winter camp. Ashleigh, the owner of TRAINED2GO SOCCER ACADEMY, LLC, led a clinic emphasizing technical skill on the ball. EVLV offered a fun and interactive three hour Futsal Clinic. This high pace clinic pushed the girls out of their technical comfort zone. Futsal creates an environment of "more pressure and less time".